While Lebanon is struggling to contain the effects of neighboring Syria’s civil war and the influx of more than one million refugees—who now represent more than a quarter of the population of Lebanon—the country has been left with no president since May 2014 because of the failure of Lebanese politicians to agree on a successor. The most recent ex-president, Michel Suleiman, left the presidential palace on 25 May, the last day of his six-year term, leaving a political vacuum that worsens the already fragile situation. Despite several attempts to avoid the vacancy—the Lebanese parliament met for an eighth time on 2 July to attempt to elect a new president—no consensus was reached among the various local actors, and no real democratic game was possible. This is the result of two major factors. One is the deep division, heightened by the Syrian crisis, between Lebanon’s two main blocs, the 8 March alliance, led by the Shiite political party Hezbollah, and the 14 March coalition, run by the Sunni Future Movement. This division deepened further after Hezbollah’s decision last year by to send fighters to Syria, in support of Bashar al-Assad. The other major factor is the boycott of the parliamentary sessions by a majority of the 8 March deputies that left it unable to reach the quorum required for democratic, competitive elections. In fact, a controversial constitutional clause implies that the physical presence in parliament of two-thirds of the representatives is required for the electoral process to take place. This corresponds to 86 parliamentarians out of the 128 members of the National Assembly (Majlis al-Nuwab). Hezbollah and its Christian ally, the Free Patriotic Movement (FPM) led by Michel Aoun—along with their other allies (Marada, SSNP, etc., but not the Amal movement, whose chief, Nabih Berri, also head of the parliament, decided to participate to the electoral sessions)—have more than 40 deputies, which allows them to prevent a quorum from being reached. These two major parliamentary blocs refuse to participate in elections, justifying their position by the absence of a consensus candidate as a prerequisite for holding elections including all parties. The underlying intention remains, however, the protection of Hezbollah’s weapons and its military involvement in Syria and thus the avoidance of a new president who would oppose Hezbollah’s strategy or who would recall the “neutrality” spirit of the Baabda declaration, issued by the National Dialogue Committee in June 2012. For the 14 March coalition, the other camp’s attitude is a denial of the most basic principles and rules of democracy. It accuses the 8 March parties of not officially declaring any candidate, boycotting parliamentary sessions, and calling for a consensus that would revolve solely around the person of Michel Aoun, considered by his opponents as a biased Christian who unconditionally supports Hezbollah and the Syrian regime. On the other hand, however, 14 March itself impeded the prompt election of a new president by putting forward as their candidate Samir Geagea, head of the Lebanese Forces (LF), the major Christian party of the 14 March coalition. As a former warlord, Geagea has been accused of numerous crimes during the Lebanese civil war. During the last eight parliamentary sessions, only one “ordinary” round (the first session), on 23 April (see the list of all sessions below), saw almost all deputies meet to elect a new president. 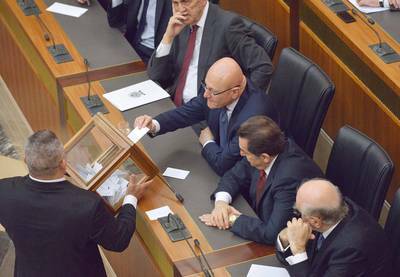 Only two candidates were officially running for election: Samir Geagea received 48 votes and Henri Helou, nominated by the Progressive Socialist Party leader, Walid Jumblatt, received 16. As for the other votes of this first parliamentary session, one deputy voted for Amine Gemayel (who was Lebanon’s president from 1982 to 1988), 52 deputies voted blank, and seven votes were voided. The voided votes were for candidates who were no longer alive and whose assassinations during the Lebanese civil war (1975-1990) have been attributed to Samir Geagea. 23 April: 124 deputies participated in the session, and the quorum was reached, but, no candidate received two-thirds of the votes during the first round or an absolute majority in the second round. 30 April: 76 MPs present; quorum not reached. 7 May: 75 MPs present; quorum not reached. 15 May: 73 MPs present; quorum not reached. 22 May: 73 MPs present; quorum not reached. 9 June: 64 MPs present; quorum not reached. 18 June: 63 MPs present; quorum not reached. 2 July: 64 MPs present; quorum not reached. The vacancy in the president’s office is the most recent crisis for Lebanon’s fragile political system, which relies on agreements among the country’s myriad political parties and religious sects—and often their foreign backers. Reaching such agreements has become more difficult in recent years, as the country’s politicians have lined up on opposite sides of the civil war in neighboring Syria, some expressing support for President Bashar el-Assad and others supporting the rebels. Over the past three years, the country has witnessed the two longest political crises since 1990; Lebanon was left with no government during a cumulative 16-month period, while the parliamentary mandate, which expired in June 2013, was extended until the end of 2014, in the absence of new elections. The cabinet, whose own formation in February had been held up for nearly a year, is supposed to organize parliamentary elections later this year, but the country first needs a new electoral law to govern the vote. Some fear that this might not be possible in the current circumstances, leading to a facto extension, while the current parliament can no longer vote new laws because of the presidential vacancy, as stipulated in the constitution. This paralysis of the three pillars of the republic and the two major powers (executive and legislative) stems from a heritage in Lebanese politics, in which major decisions have always been made by foreign powers. In fact, during 15 years of civil war and other 15 years of Syrian tutelage, the Lebanese got used to taking instructions from foreign patrons who inspired—and sometimes ordered—them to take particular actions. Former presidents Hrawi (1989–1998) and Lahoud (1998–2007) were appointed by the Syrian regime and enjoyed mandate extensions, as decided by Hafez al-Assad, and later his son, Bashar, who were in total control of the political life in Lebanon until 2005. Illustrating the failure of the Lebanese democratic experience, resulting from both internal and external factors, all presidential elections since the 1970s have been “selections” rather than real democratic exercises, by which people can elect their president from among several candidates. In 1976, Elias Sarkis was elected by the parliament against another candidate for the last time since 38 years. In 1982, Amine Gemayel succeeded Bashir Gemayel, after his assassination, and, between 1988 and 1990, Lebanon had no president until the election of René Moawad, who was assassinated a couple of weeks later. After the end of the civil war, three other presidents where “elected,” with no opposing candidate, with two mandates extended for three-year periods, in 1995–1998 (Elias Hrawi) and 2004–2007 (Emile Lahoud). On another level, the lack of a president leaves Lebanon’s Maronite Christians, themselves divided between the 8 March and 14 March coalitions, without their most prominent political official. Under the agreement that ended the 15-year civil war in 1990, the president of Lebanon must be a Maronite Christian, the speaker of parliament a Shiite Muslim, and the prime minister a Sunni Muslim. Many worry that a long vacancy could weaken Christian influence in the country, especially because, according to the constitution, the president’s duties fall to the cabinet, in the case of a vacancy in the presidency. This would leave the sectarian country run by a Sunni prime minister and a Shiite speaker of parliament. Lebanese Christians, who now make up about 30 percent of the population, have already been greatly weakened over the past 30 years, losing important political prerogatives in the wake of the Taif agreement, which ended the Lebanese civil war. As a result, a committee of constitutional experts was formed by the outgoing president to study these gaps and draft constitutional amendments to be handed to the new president. 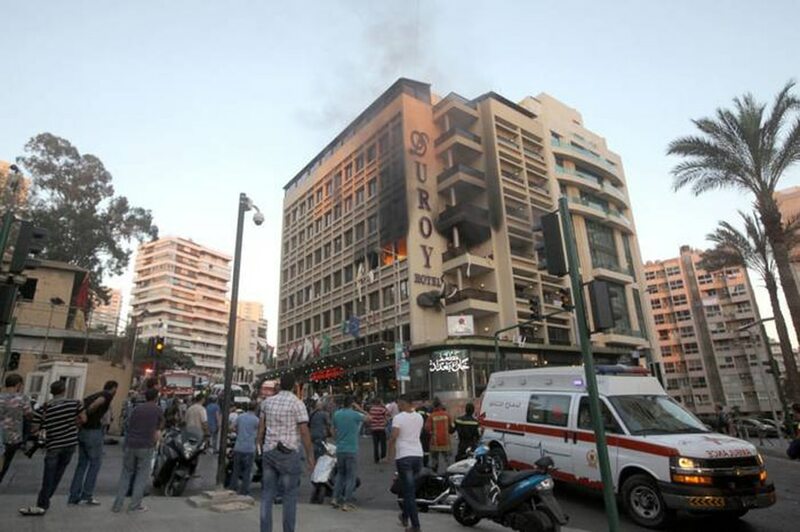 The current situation may also have serious repercussions for the Lebanese economy. At just one percent annual growth, Lebanon is already facing serious socioeconomic challenges, as a result of the growing political and security instability, both locally and regionally. More than 14 explosions and terrorist attacks have hit the country since May 2013, three of which occurred after the end of the presidential term. Furthermore, Syria’s crisis has cost Lebanon more than 7 billion dollars between 2012 and 2014, according to the World Bank. Economists especially fear the increasing public deficit, which has reached a historic level in 2013, at more than 4 billion dollars, while public debt continued to grow, to about 65 billion at end of April. Without a solution, the country is headed for a situation like that of Greece, with a debt projected, by some economists, to reach 100 million dollars in less than five years.